Ticket Update (08Jan2015, 11:30PM): SOLD OUT! No tickets will be available at the door. Thanks Sundre for the support!! Did you know that Elvis’ birthday was January 8th? Well can you think of a better way to celebrate it than with Steve Pineo’s Elvis show? 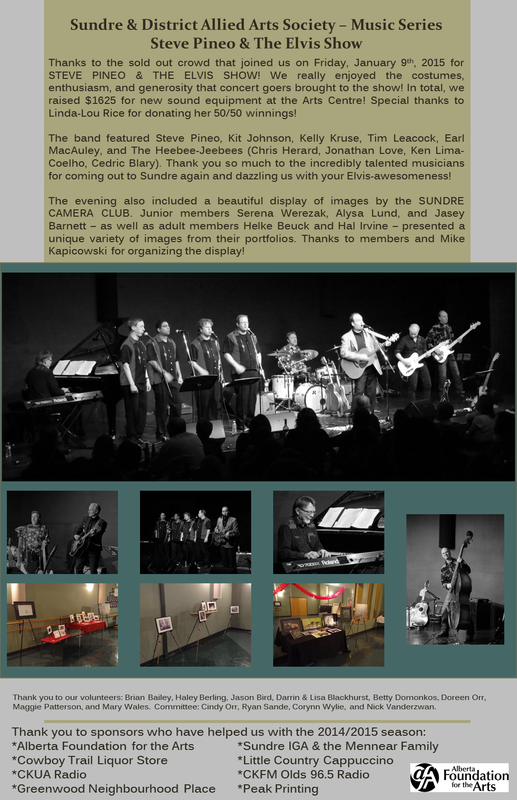 Last year, the band knocked the socks off of Sundre and we’d like to bring them back for another round! Eight dollars from each ticket sold is going directly to fundraising efforts for the Arts Centre. Please join in on a fantastic night with Steve and his 9-piece band, also featuring The Heebee-Jeebees! SUNDRE CAMERA CLUB: This will be the club’s third year joining us and last year’s display demonstrated interesting compositions of artistry, technique, and talent - we’re sure this year’s display will be even better! Please visit the Sundre Camera Club's Facebook and Flickr pages to preview some of their work!